Whoever is in charge of publicity for The Dark Knight is well versed in the art of geek titilation. Set photos and promotional artwork have been trickling onto the Internet for the past few months, each giving fans just a small taste of what's to offer. These two gems hit this week and, while they give very little away, they're already generating a lot of buzz. This first poster is pretty straightforward. 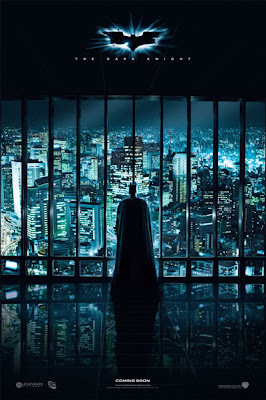 It's obviously Batman looking out onto the city, but there's more at work here symbolically. That is, why is Batman inside a building? Shouldn't he be on the roof? Or is he looking out a window at Wayne Tower? And what of the vertical lines? This suggests entrapment imagery, but who is trapped? Is it Batman who is trapped or is it the city itself? The plot thickens. Well, that's kinda creepy. 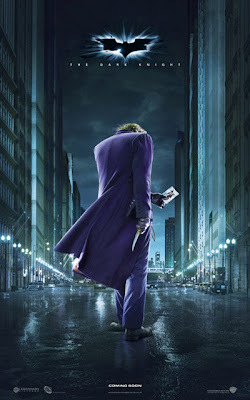 The Joker walking through the empty streets of Gotham, hiding a knife behind his back. He's sporting his trademark purple duds, which should appease fanboys, but I'm digging how subtle this poster is. It showcases the duality of the character: a Joker playing card in one hand, a knife in the other. Of course, this is all needless speculation, but I think we've got a good film to look forward to this summer. Until then, I'm sure we'll have plenty of promotional materials to pick apart, overanalyze and geek out over before the film's release. Mass Effect: Game of the Year?